Writer Phil Hester takes the keys as Dynamite launches a new series starring the classic comic characters Magnus: Robot Figher, Turok: Dinosaur Hunter and Solar: Man of the Atom. 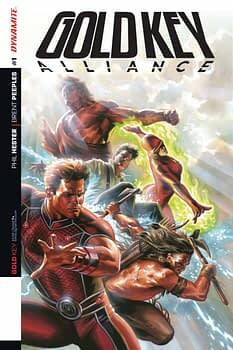 Byron Brewer caught up with the writer about Gold Key: Alliance #1 and working with artist Brent Peeples. Cover art by Felipe Massafera. BYRON BREWER: This miniseries continues Dynamite’s celebration of the Gold Key Universe. Phil, tell me how this particular limited series came to be? Is it the climax we have been waiting for when Turok, Solar, et al were in their own titles? PHIL HESTER: I’ve been a fan of the characters all my life, so when [Dynamite editor] Joe Rybandt asked if I had a take on each one, I actually had to sort out which of my many approaches to these legendary heroes I wanted to present. Ultimately, I thought one that would place all of them in the same place at the same time would make the most sense to a modern audience. As to how Gold Key: Alliance relates to the most recent take on the Gold Key heroes, it actually goes its own way, but finds a sneaky way to include both the recent and classic continuities. BB: Tell us what you can about the storyline please. PH: Well, I don’t want to spoil too much, but when we join the action Magnus is a secret agent of sorts monitoring the rise of military artificial intelligence and robotics around the globe. Turok is a reality television star and tribal park ranger in charge of some rather unique specimens. Solar is a young doctor on a mission of mercy in an impoverished part of Africa, and poor old Samson is a raving homeless man ranting at unseen monsters on the streets of Manhattan. Soon they are all drawn together by a force that threatens to tear not only our world apart, but every possible world in the multiverse. BB: So the characters are all in the same time and same world now …? PH: We’re approaching the heroes as if these are all new origins that take place here and now, on our Earth in 2016. We hope to present enough parallels to the past continuities to make old time fans feel at home, but stake out new territory that’s fresh and exciting to new readers. I hope, in taking a new approach, we find a way to be true to the essence of the characters in a way that a simple recapitulation of the old stories would not. BB: Artist Brent Peeples has made quite a name for himself in books like Last of the Greats and Legenderry: Green Hornet. Why is he right for this book? PH: The kid is ready! His work is on such an upward trajectory that I feel like we were lucky to get him before he blows up at Marvel or DC. My bet is his work on this series, with his gift for dynamic action, and attention to lighting, texture and character, will make the Big Two regret they let him get away.